One more post today, because this is an important one. 😉 Yesterday was Independence Day here in America, and for space geeks, it was important for another reason — it was the twentieth anniversary of the Pathfinder landing on Mars, and marked twenty years of continuous exploration of the Red Planet. It’s amazing to think about. I remember exactly where I was on July 4, 1997. I was at an Independence Day party at my uncle’s house, and he had a TV on for the nerdier among us to watch and see when Pathfinder landed. It was very exciting. Pathfinder was the first lander to operate on Mars since November of 1982, when Viking 1 lost contact with Earth, a very long gap. Mars had developed a powerful reputation as the Bermuda Triangle of the Solar System. Before Viking, there had been 21 attempted missions to Mars, but only six had been successful. After Viking, there were no further attempts until 1988, when the Soviet Union sent the ill-fated Phobos missions, both of which failed. In 1992, NASA made another attempt with Mars Observer, which is believed to have exploded just before orbital insertion due to a fault in its propulsion system. It seemed like Mars was off limits. The next Mars transfer window came and went. In 1996, another Mars window opened, and this time both NASA and the Russian Federation’s Rosaviacosmos were prepared to send spacecraft. It would be one of the last ambitious deep space efforts by Roscosmos for some time. Rosaviacosmos sent Mars 96, a highly ambitious spacecraft built collaboratively with European nations and carrying an orbiter, landers, and ground penetrators. It failed to leave Earth orbit, and eventually reentered Earth’s atmosphere. (The same fate would later befall Fobos-Grunt.) NASA sent Mars Pathfinder, its hitchhiking Sojourner rover, and Mars Global Surveyor. On July 4, 1997, Mars Pathfinder landed on Mars with an innovative tetrahedral lander studded with airbags, which allowed it to hit the surface in any configuration and still end up upright at the end. Although Pathfinder had a brief scare due to an undetected race condition in its computer software, it was recovered and went on to a very full mission, deploying the breadbox-sized Sojourner rover to become the first wheels on Mars. Pathfinder continued operating until October 7, 1997, beating its design specs by about two and a half months. But before it failed, another spacecraft arrived: Mars Global Surveyor, the first fully successful Mars orbiter since the Viking Orbiters in the 1970s. Mars Global Surveyor set a record (since beaten) for total operating time at Mars, lasting nearly a decade (well past its one-year primary mission), going on to conduct joint observations with later spacecraft and serving as the first Mars communications relay station, transmitting data from landers back to Earth. After Pathfinder and MGS arrived, many more followed, although Mars continued to earn its reputation as the Eater of Space Probes. The 1998 launch window was fraught with failures, from the Japanese Nozomi probe (ran out of propellant prematurely due to a fault), to NASA’s Mars Climate Observer (killed by an unknown unit conversion error resulting in deorbit rather than orbit capture), to Mars Polar Lander (lost due to premature shutdown of the landing engine) and its piggybacked Deep Space 2 penetrator (MPL crashed before it could be deployed). But the 2001 window showed a reversal of fortunes. MGS, the lone operational spacecraft at Mars, would be joined by NASA’s Mars Odyssey 2001, which remains in operation today. In 2003, MGS and Odyssey would be joined by ESA’s Mars Express, which continues to operate today, although Mars Express’s piggybacked Beagle 2 lander (provided by the United Kingdom) never called home. Orbital photography eventually revealed that it had landed in a very unfortunate posture among a boulder field, and was likely unable to open itself properly — this is a risk for any robotic lander, and one that is nearly impossible to prevent. But also in 2003 launched two of the most phenomenal overachievers in the history of Mars exploration: NASA’s Mars Exploration Rovers, Spirit and Opportunity. Both operated far past their original three-month mission. Spirit was eventually killed when it became mired in a posture which did not give its solar powers enough light during the long Martian winter, but Opportunity remains in operation today, having set both endurance and mileage records. The 2005 launch window saw the most powerful camera ever sent to Mars, aboard Mars Reconnaissance Orbiter. This spacecraft has enabled exquisitely detailed imagery over time, tracking changes in the surface features of the Red Planet beyond the capabilities of its predecessors, and even photographing many of the landers and rovers. MRO remains in operation today. 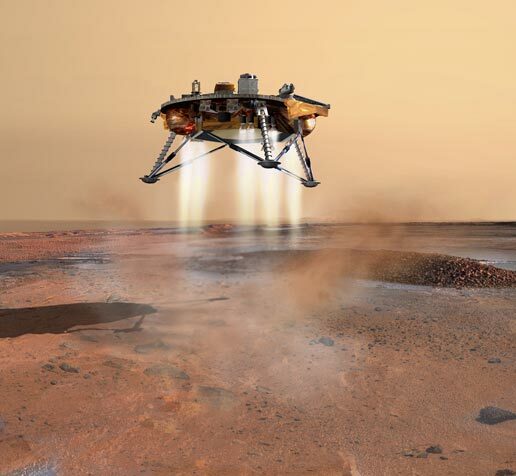 In 2007, Mars Phoenix Lander was sent, partially reflying some of the experiments planned for Mars Polar Lander, as well as following new plans, adhering to the overall NASA strategy of “follow the water”. Phoenix operated for 157 sols (Martian days), nearly double the planned mission duration, when the polar darkness of winter arrived and claimed it. Among its many discoveries was the first observation of liquid water on the surface of Mars, likely water melted from the icepack by its landing rockets and then briefly recondensed on the spacecraft’s landing legs before boiling away in the low atmospheric pressure. The 2011 window saw both tragedy and triumph — first, the loss of Roscosmos’ Fobos-Grunt and its piggybacked Yinghu0-1 lander from China, and then the brilliant success of Mars Science Laboratory “Curiosity”. Curiosity is by far the largest rover ever sent to another world, so large that the tetrahedral airbag lander of Mars Pathfinder and the twin Mars Exploration Rovers would not suffice. Instead, a “Skycrane” vehicle was devised to bring it in like a helicopter. The system worked perfectly, and Curiosity remains in operation today, although the perils of exploring the unknown have been driven home by the shocking amount of damage in its aluminum wheels; the rocks of Gale Crater seem to be much harder and sharper than those encountered anywhere else that landers have visited. In 2013, NASA’s MAVEN was launched; it is still operating in Mars orbit today. And another nation joined the elite club of deep space explorers, as India’s ISRO placed the Mangalyaan (Mars Orbiter Mission) spacecraft into Mars orbit. It, too, remains in operation today. 2016, the latest Mars window, saw the launch of ExoMars, a collaboration between ESA and Russia, and its piggybacked Schiaparelli lander. ExoMars remains in operation today, while Schiaparelli unfortunately was lost on landing. So, that makes 20 continuous years of spacecraft operating on Mars or in orbit around it, and today there are six functioning orbiters and two functioning rovers on the surface. It makes a wonderful change from the long drought of Mars exploration before that! It is quite likely that there will never again be a gap in Mars exploration, not now that there are so many different space agencies at work on it. The next window opens in May. NASA plans to launch its InSight spacecraft (delayed from the 2016 window). In 2020, things get really busy. NASA has another mission in the planning stages, and Europe and Russia will be collaborating on the second ExoMars spacecraft. China and Japan both are planning to make their second attempts for Mars, and the United Arab Emirates is planning their first deep space mission, and India might manage their second Mangalyaan in that window (if not, they’ll likely make the following window). And perhaps most intriguingly of all, in 2020 SpaceX is planning their Red Dragon mission, the first crewed mission to Mars (unless someone manages to beat them to it). We’ll have to wait and see if they can actually make that date; it seems a tad ambitious to me! But wouldn’t it be exciting? Space History for August 4: MARS! There were two major events in Mars exploration history on this date. In 1965, Mariner 7 became the third spacecraft to return pictures of the Red Planet, flying past at an altitude of 3,430 kilometers above the planet’s surface. It was a close thing, too, since less than a week before, JPL had lost contact with the probe, believed to be due to gasses leaking from its battery interfering with the signal from the high-gain antenna; JPL managed to regain contact using the low-gain antenna and were able to sort things out with the high-gain antenna just in time for the pass. They were even able to mark targeted observations based on the data returned by its twin Mariner 6, just a few days ahead. Then, on August 4, 2007, a Delta II 7925 rocket blasted off from Cape Canaveral carrying the Mars Phoenix Lander, constructed largely of flight spare components from the ill-fated Mars Polar Lander mission. Phoenix would complete its nine-month cruise and land successfully on Mars on May 25 of the following year. Amongst its many discoveries was the first observation of liquid water on the Martian surface — water droplets that briefly persisted on the lander’s legs shortly after touchdown, and then rapidly boiled away in the tenuous atmosphere. Its surface mission lasted 157 sols, 67 past the mission objective, before the Martian arctic winter claimed it forever.